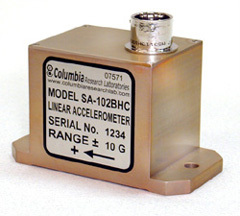 The Columbia Models SA-102BHC and SA-302BHC are compact, premiumperformance force balance accelerometers, extremely rugged and well suited for demanding missile and airborne applications. Both the single-axis SA-102BHC and triaxial version SA-302BHC are designed to operate from +24 to +32 volt aircraft supply and deliver a bi-polar +/-5 volt output isolated from power ground. The basic systems have been qualified and supplied in substantial volume on many small missile programs. These designs have also been selected by a number of aircraft instrument manufacturers as key components of their strap-down systems. Consult the factory for customized versions of these sensors. +24 to +32 VDC 50 mA Max.